P.S: This does not mean the holocaust began Dec 12th, 41 onward. It was merely Hitler giving the green light to start ramping things up. The Einsatzgruppen had already been mass killing Jews, not just males, but also women and children in the months before 12/41. The first gassing at Auschwitz I's Block 11 had also occurred by this time, although it involved Soviet POWs, I think. Aaron, for more, here are links to (a) Gerlach's article (downloadable PDF) and (b) our longish, acrimonious thread debating this. I prefer Gerlach's describing the 12 December development as "Hitler's decision in principle" to calling what occurred an "order"; Gerlach explains this in his article. It was not until the Red Army fought the Germans to a standstill before Moscow and then forced them to retreat to defensible lines for the winter, that Hitler conceded that Barbarossa had gone wrong and looked for scapegoats; but the people he blamed were the generals, not the Jews. Relying on an article written in the 1990s by the German historian Christian Gerlach, Snyder asserts that it was at this moment that Hitler took the decision to annihilate Europe’s Jews, in fulfilment of his ‘prophecy’ of January 1939 that if the Jews started a world war, they would be the ones who would die. But while there is certainly evidence that he informed his satraps that the Jews would be killed, this does not amount to a decision. In his argument that the decision to kill the Jews was taken on 12 December 1941, Gerlach pointed to the entry of the US into the war the day before as the trigger, not the Red Army’s success in pushing back the Wehrmacht from the gates of Moscow (that didn’t begin until 16 December). In any case, few historians have accepted Gerlach’s claim, and he subsequently distanced himself from it. Which on the face of it seems to ignore any pressure from below, eg, Frank, or is that supposed to be understood as a component driving Hitler and Onkel Klubfoot? Yes, the article is really quite well known and has been widely discussed. Just to say, without repeating the earlier arguments we've had but addressing Evans, in a recent (2016) book Gerlach refines but does not "distance himself" from his earlier article. Evans' assertions, which read as somewhat polemical above, don't match my reading. In fact, in the case of Gerlach, his 2016 book puts it like this, following right on discussion of US entry into the war: "As a batch of documents shows, Hitler announced his decision in principle to murder all of Europe's Jews on or around December 12, 1941." In this section of his book, Gerlach cites his 1998 article. Many historians discuss mid-December much as Gerlach did in the (in)famous article (a recent example is Cesarani, who builds off Gerlach's argument), many don't. Evans' book reviews (the review of Hett's Reichstag fire book being another case) seem kind of off to me. It is a polemic. He was writing it because he was frustrated by a review of his “The third Reich at war” by Timothy Snyder. Denying-History wrote: It is a polemic. He was writing it because he was frustrated by a review of his “The third Reich at war” by Timothy Snyder. So he took an unfair swipe at Gerlach LOL Prickly and grouchy indeed! Would not call it an order too, though more due to form than substance. Fuehrer's wish was the law, whether expressed as an order or a vague concept. It won't come as a surprise to Statmec that i kind of agree with Evans. It is just absurd to consider that an order or even an intention clearly expressed to launch one of the biggest massacre in history would have been made in front of a crowed of 50 people, among them lower ranking Gauleiters. Evans is right in saying that Gerlach article is among the last attempt to identify THE DATE, as a quest for the Grail. In some cases it seems that Holocaust historians seem to forget that there was also a war going on - no not in the Denier sense of course - but this 12 of december 1941 meeting with the authorities of the Nazi States is to be placed into the perspective of the dramatic evolution of the war ( as opposed to a declaration of a new turn of the Jewish policy). The year 1941 which for a Gauleiter started full of promises was ending with Nazi Germany clearly in danger, with the addition of the declaration of war against the USA. Hitler HAD to report and confront his base. That Hitler ended up blaming the Jews for the failure of Barbarossa is no surprise, and that he once again used his assassin rhetoric - his "prophecy" is not either. Most of the attendees already knew about the massacres of Jews on the Eastern front, so in this regards, they did not need this meeting. But this meeting was a necessity to prepare the Nazi State for what will follow: turning the German economy into a full war economy - something unpopular those Nazis did not even care to do earlier (or very lightly) - the big revolution to come withing the OKW and OKH, to prepare for even more rationing of food, etc. ... to make those golden pheasants understand that now the war has become a serious and dangerous matter, so to conclude on the prophecy was quite a logical move. Of course, it is also undeniable that the intention was also to prepare the attendees to new initiatives to come regarding the Jewish question, but not something even close as an open call that from now on the Jews will have to be exterminated physically...This was not supposed to be their (the 50 attendees) business anyway. As for the "decision part", well...as i said, extermination had already been launched and accepted in the East, and it seems that the extermination of the Jews in Poland on a global scale was already under discussion, if not already completely decided and already started locally (aka Lodz and Chelmno) while the decision to build Belzec had also already been taken; but the chances that those kind of decisions were to be shared with a public of 50 officials is close to 0. As promised to Statmec, i won't derail on my personal interpretations and theories form here. Balsamo wrote: It won't come as a surprise to Statmec that i kind of agree with Evans. Attempting to avoid going through all this again, I focused on Evans' claim that Gerlach has distanced himself from his 1998 conclusions and his dismissive remark about other historians. I think he is wrong on these two points, at least as of the latest English language book (2016) on the Holocaust which Gerlach has published, published in fact subsequent to Evans' article, and gave some examples of how so. Except that Gerlach's consideration of US entry into the war was stated in his article and alluded to in his recent book. that Gerlach discussed a decision in principle embracing European Jews, not those of the east or of the Warthegau etc. Can you explain what is meant by "lower ranking gauleiter"? Mind there is a 6 year gap though. Evans made his statement in a review around the publication of Snyder’s - mixed bag - “Bloodlands” (2010). So anything as open for now, but it’s possible Evans is wrong. Once again. Balsamo confuses me a bit, and it definitely can be considered a date for an order based on Martin Bormann's diary. Final attempt or not it may be the date Hitler came to the final conclusion for the Jews fate, which would make sense if Irving is right about Hitler wanting only a “Small war” with Poland in which he wouldn’t advance into Russia later on. Denying-History wrote: Mind there is a 6 year gap though. Evans made his statement in a review around the publication of Snyder’s - mixed bag - “Bloodlands” (2010). So anything as open for now, but it’s possible Evans is wrong. I know of nothing to say that Evans is right. His article was 2012 or something but I can't find where Gerlach walked back his thesis before that and he reiterated it in 2016. I know Evans was pissed at Snyder but overstating his case by bringing in Gerlach this way doesn't do him any good. Denying-History wrote: it definitely can be considered a date for an order based on Martin Bormann's diary. Goebbels? Anyway, Gerlach uses a lot more evidence and contextual thinking than Goebbels' diary. Sorry, indeed i mixed things up a bit. No don't worry, i will not go into January 42. Which is precisely what i disagree with...for the reason explained. Well, Gauleiter was primary a rank within the NSDAP, associated with authorities over local/regional NSDAP organization, and by extension led to regional administrative powers. The NSDAP Court around the Fuhrer was constituted by Reichsleiters (higher rank) and Gauleiters. All those parallel ranking within every Nazi organization are a bit tricky. But as in the SS, the rank held was not the main source of power and influence. Some Gauleiters were just members of the Reichstag, their local authority was delegated to a Deputy Gauleiter. Other Gauleiters held the highest functions and were directly involved in the Holocaust. This is also valid for the Reichsleiters. A few example: Erich Koch is well known for his crimes in the Ukraine. Less known is that he was also a Gauleiter (of East Prussia), but he held his power from being the Reichskommissar in the Ukraine. A similar example is Hinrich Lohse, who was Gauleiter of Schleswig Holstein, but was mainly known for his role as Reichskommissar in Ostland. Others very important Gauleiter, important in term of personal power and their role in the Holocaust, include Greiser (Warthegau) and Forster in Danzig West Prussia, but their held their authority from the charge of Reichsstatthalter of those Gau. On the lower scale you had Julius Streicher, who also was Gauleiter but known for his Sturmer paper. Other example, Goebbels was Reichsminister, Reichsleiter and Gauleiter of Berlin... Of course, he held his power from being Reichsminister. Hans Frank on the other hand was also Reichsminister (without portfolio), Reichsleiter but held his authority as Generalgouverneur of occupied Poland. As i said, other Gauleiters were just member of the Reichstag, and would have no direct role in the Final Solution. So when it is said that Hitler held a meeting with Reichsleiters and Gauleiters, it clearly refers to ranks within the NSDAP, that is the elite of the Party. As far as i know, the NSDAP was not directly in charge of the Final Solution (that was Reichsleiter Himmler's job, as Reichsfuehrer SS through the RSHA and the powers authorities given to ). Given the lack of discipline within the NSDAP (as a political structure), some Gauleiters being just old "Kampf comrades" ("Alte Kampfer"), sharing with the Party plans for extermination of the Jews on a European scales would have ruined any attempt to keep a secrecy around the Final Solution, especially noticeable for AR. Gerlach speculated on a meeting for which we have no speech but an a few lines of an entry in Goebbels diary, giving -or so it seems - no consideration on who the public of this meeting actually was. I don't have this entry, but it is said to be 7 pages long. Balsamo wrote: Gerlach speculated on a meeting for which we have no speech but an a few lines of an entry in Goebbels diary, giving -or so it seems - no consideration on who the public of this meeting actually was. I don't have this entry, but it is said to be 7 pages long. This is such a distortion as to be untrue. While it is true that Gerlach has Goebbels’ diary entry for the remarks made on the 12th, Gerlach pays attention to the overall context, focusing on a series of meetings and discussions taking place in mid-December: a meeting of 13 December, a meeting of 14 December, “a note made by Rosenberg on December 16, 1941” about the discussion between him and Hitler on 14 December, regional planning efforts, probably attendees on 12 December, Hitler’s meeting with Himmler on 18 December, speeches including one by Heydrich, during this time, Foreign Ministry correspondence and directives, Frank’s 16 December speech to officials of the General Gouvernement, among other sources. The context in which Hitler announced his decision is itself revealing. The announcement was made not in the most inner circle, not informally in a confidential conversation with Himmler, and not within the narrow confines of his close circle of advisers, Goring, Heydrich, and Bormann. Nor was it a meeting of government officials, though some of the men present did hold such posts. Rather, the announcement was made before an official body that included his oldest and closest political comrades; some fifty people were present. His message was this: the destruction of the Jews was first and foremost a party matter. . . . Some of those present at the announcement had already urged Hitler to take harsher steps against the Jews. . . . One thing more about the meeting should be noted. Meetings of the Reichsleiter and the Gauleiter were normally held in the conference rooms of the New Chancellery or in one of the party buildings. For this meeting, however, despite the official occasion, the setting was a private one, in Hitlers residence. There is nothing exceptional about doing history the way in which Gerlach worked here - examining a range of evidence and making inferences, filling in blanks with informed suggestion, and drawing conclusions from the sources where explicit, smoking-gun type documentation isn't available. Balsamo wrote: It is just absurd to consider that an order or even an intention clearly expressed to launch one of the biggest massacre in history would have been made in front of a crowed of 50 people, among them lower ranking Gauleiters..
On the contrary, the meeting with Reichsleiter and Gauleiter on 12 December 1941 fits very well in the chronology, as it falls before the meeting of state secretaries on 20 January 1942. Since Nazi Germany had ceased to be run by proper cabinet meetings, the Reichs- and Gauleitertagungen and Staatssekretaerbesprechungen served to announce or discuss some major political decisions. In this case, Hitler's decision to destroy European Jewry as a whole. Note that I said 'destroy European Jewry', which fits with the trajectory of policy radicalisation at this time. No order to massacre, kill or exterminate European Jews as a whole was given at this time; destruction was understood as something that would be brought about by a mixture of decimatory killings (or killings of swathes in certain regions, such as the USSR) together with deaths through deportation, privation, forced labour, ghettoisation, etc. This was the policy stated at Wannsee but the outcome, the physical destruction of European Jews, was what had been decided upon in late 1941. The Nazis and SS were still debating where to deport Jews until February/March 1942 and also what to do with them once expelled from the Reich, and were debating how many Jews would be deported from other parts of Europes, and the sequence, well into the summer of 1942 and indeed beyond. But the basic principle of destruction as a pan-European principle dates from December 1941. Many if not all in the political circles of Reichsleiter, Gauleiter and State Secretaries had some idea of the mass killings of Soviet Jews because they received copies of the Taetigkeits- und Lageberichte of the Einsatzgruppen - one of the copies submitted at IMT Nuremberg was stamped by the office of the Reich Defense Commissar for Vienna, i.e. Gauleiter Baldur von Schirach. We similarly know that Stuckart knew of the Rumbula massacre. Actually i did not need Evans to make my opinion on Gerlach article, although i appreciate when i see other sharing my doubts. I admit that i do not recall what is in Borman's diary. But even the few lines Goebbels dedicated among the 7 pages to this issues is quite thin to conclude that the intention to murder the European Jews was announced again to people who mostly (with the exception i gave) would not be in charge. I need to explain more i think: I do not reject the possibility that Hitler took his decision in december 41, maybe, maybe not, maybe only partly...there are loads of theories out there. My critics are addressed to Gerlach who use a meeting between Hitler and the elite of the NSDAP to "prove" that the decision was made on that date. So to be clear i have not read his 2016 work - i probably will - so my critics are limited to his 1998 article. In this article, his premises, hence his methodology, is quite off limits in my opinion, that is a very weak premise on which are based a lot of speculations. Balsamo wrote: My critics are addressed to Gerlach who use a meeting between Hitler and the elite of the NSDAP to "prove" that the decision was made on that date. Which is a mischaracterization of Gerlach's article, and the various threads of his case, just as Evans mischaracterized Gerlach's current views: to score points. In his 2016 book Gerlach discusses mid-December in much the same terms as he did in 1998, and he adds in discussion of "two accelerations" of the measures being taken against the Jews (geographic scope, pace, methods including "death camps," "central coordination"), in spring and summer 1942, along with policy responses to "obstacles" encountered during 1942, similar to the frame Nick Terry gives above. His thesis is/was based on the assumption that the decision was taken and shared during a meeting on December 12, 1941. Given that we do not know what has been said during this 2h30 long meeting, he illustrated it with a few lines within 7 pages in Goebbels diary, which literally is quite identical to what Hitler declared before, and quite similar to what he will repeat ad nauseam after to Goebbels, which is basically the destruction of Jewry (often wrongly translated into extermination of the Jews). Then of course, the month of December 1941 was high in political activities, probably on every possible subjects, including the Jewish Question. But it goes in that order...and the political activity of december 41 could be the context of any date during this month. Rather, the announcement was made before an official body that included his oldest and closest political comrades; some fifty people were present. His message was this: the destruction of the Jews was first and foremost a party matter. Is THE POINT which i consider the result of speculation, a wrong premise on which he built his thesis. I do not dismissed the entirety of his article, but when the premise is wrong or at least not enough supported to use more polite terms, it affects the whole work. First of all, it is ill founded to consider that Hitler might have think that the Final Solution was "first and foremost a party matter", it has never been the case before and never be the case after...except for some selected. For AR, Himmler will quite on the contrary chose a disgraced former gauleiter to lead the killings, and not one of the "Alte Kampfer". One thing more about the meeting should be noted. Meetings of the Reichsleiter and the Gauleiter were normally held in the conference rooms of the New Chancellery or in one of the party buildings. For this meeting, however, despite the official occasion, the setting was a private one, in Hitlers residence. The Fuhrer Chancellery staff should not be confused with these "Alte Kampfer", by the way. But in this specific case - again i only insist on the premises of Gerlach 1998 article - as far as methodology is concerned, you first examine the range of evidence, make supported inferences in order to reach a conclusion, which would become a thesis, which would resist refutation the best it could. Here it is not the impression i had when reading this article. It is almost the other way round. He seems to have spotted a potential DATE, the Grail that at the time many were looking for, a meeting with Hitler and a quote in Goebbels diary, and made it is premise first then would try to supported by examining evidence and by making inferences...So far from being a conclusion, it seems to me that his date of the 12th of December 41 was his starting point. If this is the case, it would be methodologically wrong. My point is not to dismiss the hypothesis that the decision could have been taken within the month of december 41, but for the same price it could have been any other date: why not his meeting with Himmler on the 18th...or whatever meeting before the 11th...the problem being of course that there is no way to really support that with sources...But hey there is kind of hint for the 12th...so let's go for it. And Gerlach did...at least, it is my impression. PS: I am going to get his 2016 work, so nothing above concerns it. May take the time to email him once I get rested. Rough night. From memory Irving cites a passage from Martin Bormann‘s diary showing the attendance of a number of associates. And gives the time of the meeting if my German isn’t that crappy. It’s important considering it confirms the date of the meeting. Goebbles diary is important for context to the meeting but I think the former is a bit more important. Hitler made another statement also in October 1941 which may also support the December decision period for a centeralized understanding of the extermination program. May quote later but I’m currently stuck with only two books on Bosnia. And kinda half-asleep. Though I didn’t mean to imply it as “the order” what I mean is it became the period in which Hitler decided to centerialize “his” program. Balsamo is still confusing me... he seems confused considering the concept of Gerlach‘s article from what I understand was presenting a thesis that the Holocaust developed greatly - “accelerated” - throughout December, not that December 12th was the date of a decision/order. I completely agree with your observation, and thanks for confirming that this speech was understood as the the destruction of "European Jewry". I have promised to Statmec, i i guess you will be relieved as well , not to come back with my interpretations which are based on the same information you just gave. I admit that i changed my mind quite often in this regards. It can also be defended that some kind of green lights was given sooner, that the first transports of German Jews to the East were some kind of test, but yes, December is probably where inferences are pointing to the most. But, as of course, there is a BUT, it does not mean that the exact nature - if this aspect was already decided - had been shared with those who not had to know. But one thing i am sure of, is that the 12th is probably the worst date one could have picked. To declare that the Jewry (and the distinction is important) will be doomed given the new situation does not mean that "systematic physical extermination of every Jews in Europe" will be used in order to achieve the declared goal. Again, the destruction of Jewry can be achieved by other means that systematic murder...not in Hitler's mind obviously(or the three HHH)...but that was not of the old comrades business and was not needed to be shared on the 12th of december or even after. To conclude, your last pòst is quite different from Gerlach article, at least in the details. Given that we went into all this "AT LENGTH" into the details no need to go further into it. Balsamo wrote: I will repeat myself. No it wasn't; his thesis was based on sources about which he reasoned. Gerlach did not "assume" a meeting on the 12th; he worked his way, through the sources, into a probable meeting on the 12th. In fact, Gerlach considered other scenarios in the light of the sources and explains why he favors the view he came to. Balsamo wrote: Given that we do not know what has been said during this 2h30 long meeting, he illustrated it with a few lines within 7 pages in Goebbels diary, which literally is quite identical to what Hitler declared before, and quite similar to what he will repeat ad nauseam after to Goebbels, which is basically the destruction of Jewry (often wrongly translated into extermination of the Jews). And most probably an allusion to the speech made by Frank a few days later. As to Goebbels, no, what he wrote was not "literally . . . quite identical" to previous declarations: the salient point is that Goebbels wrote, literally on 13 December, of Hitler's resolve that now "Regarding the Jewish question, the Führer is determined to clear the table." Balsamo wrote: Then of course, the month of December 1941 was high in political activities, probably on every possible subjects, including the Jewish Question. This does injustice to Gerlach's arguments about his sources, which you continue to mischaracterize as simply Goebbels' diary, and to his reasoning. I listed only some of his sources and didn’t go through his full reasoning on why this timing works out. I suggest your re-reading the article to see what sources Gerlach uses and arguments he makes. Balsamo wrote: Is THE POINT which i consider the result of speculation, a wrong premise on which he built his thesis. A premise is different to a conclusion. Balsamo wrote: Is this supposed to be an additional proof? No, it was simply included at the end of what I copied and pasted on Gerlach's discussion of the attendees, something you'd claimed he didn't pay attention to. Balsamo wrote: The Fuhrer Chancellery staff should not be confused with these "Alte Kampfer", by the way. Which is why I made sure to write, to do justice to Gerlach's presentation, "along with." Balsamo wrote: Here it is not the impression i had when reading this article. I would argue that your impression is mistaken. Balsamo wrote: My point is not to dismiss the hypothesis that the decision could have been taken within the month of december 41, but for the same price it could have been any other date: why not his meeting with Himmler on the 18th...or whatever meeting before the 11th...the problem being of course that there is no way to really support that with sources...But hey there is kind of hint for the 12th...so let's go for it. And Gerlach did...at least, it is my impression. Please re-read Gerlach's article before saying again what you think is in it. He explains - esp on pp 783-784, 787, 791-792 - why not other days in this period. You keep making assertions about Gerlach's thesis - he relies on only Goebbels, he didn't pay attention to meeting attendees - that don't stand up. Before we dismiss Gerlach, it might be nice to reflect accurately what he wrote. Last edited by Statistical Mechanic on Mon Jul 23, 2018 8:23 pm, edited 2 times in total. I think you need to re-read Gerlach's article, Balsamo, and to re-read several standard works on the origins of the FS (Browning, Longerich, etc) as well, to really *understand* the thesis and the argument properly. The 12.12.1941 meeting fits the overall chronology of developments perfectly for an *announcement* by Hitler of a *political decision* to the *political leadership*. The decision concerned the destruction of European Jewry, the phrases used in Goebbels' diary of course echo the various repetitions of Hitler's "prophecy" which began to be repeated in January 1941 by Hitler and other senior Nazi politicians (Seyss-Inquart, Goebbels, other Gauleiter) and in the press. These repetitions accompanied the first stage of escalation in late 1941, i.e. the major wave of deportations of Reich Jews to the east together with the various steps needed to make them happen on a larger scale than hitherto, e.g. the introduction of the yellow star, changes to the Reich Citizenship Law and the ban on emigration across Europe. The earliest date for a Hitler decision in principle to fulfil the prophecy is the early autumn of 1941 - late September/early October 1941. This could have been taken relatively privately and communicated to Himmler and Heydrich alone, who then went around trying to prepare to carry out this decision. Burrin and Browning have argued along these lines, as have other historians. But the motive underlying the repetitions of the prophecy through the summer and autumn of 1941 had propagandistic and political signifiance. Some historians have argued that the autumn '41 wave of deportations were a final warning to the United States, or could be considered a kind of reprisal/punishment for the growing likelihood of a US-German conflict. Goebbels certainly treated the first deportations in this way, see his repetition of the prophecy in 'The Jews are Guilty' from November 1941. Since the senior Nazi leadership had been listening to Hitler and to Nazi propaganda talk about the threatened destruction of European Jewry in the event of a world war from January 1941 onwards, a further, clarifying repetition at the next Reichsleiter and Gauleiter meeting was to be expected. And yes, maybe some attendees did not think through what was meant by this, *even though* many of the Gauleiter were pressuring the SS and Hitler to expel *their* Jews from the Reich, and had been piling on pressure for this since the summer of 1941 at the latest. Gerlach points to various additional pieces of evidence from December 1941 - remarks by Frank, Rosenberg as well as meetings between Himmler and Bouhler regarding T4, which correlate with significant changes, especially the solidification of plans for the extermination of the Jews of the Government-General in what was eventually known as 'Aktion Reinhard'. Gerlach also cites some testimonies from SS officers in the know, who inferred December 1941 as the starting-date; he did not cite all of them, and several were working from informed inferences rather than 'direct knowledge'. In his 2016 book, he adds another example of such a testimony, from the war years (an SD deserter to the Swiss who was evidently well informed by Brigadefuehrer Thomas of BdS Belgien-Nordfrankreich). Wisliceny, who Gerlach did not cite in this connection, likewise inferred the entry of the US into the war in December 1941 as the start date for the Europe-wide Final Solution. There simply isn't another moment for which there is better evidence than for December 1941. The evidence is not good for any moment in time, but December 1941 best fits all of the evidence and the trajectory of developments - as long as one understands that 'destruction' is not synonymous with extermination-by-gassing or immediate killing, and as long as one understands that the decision in question concerned generalising policies of destruction to all of Europe's Jews. 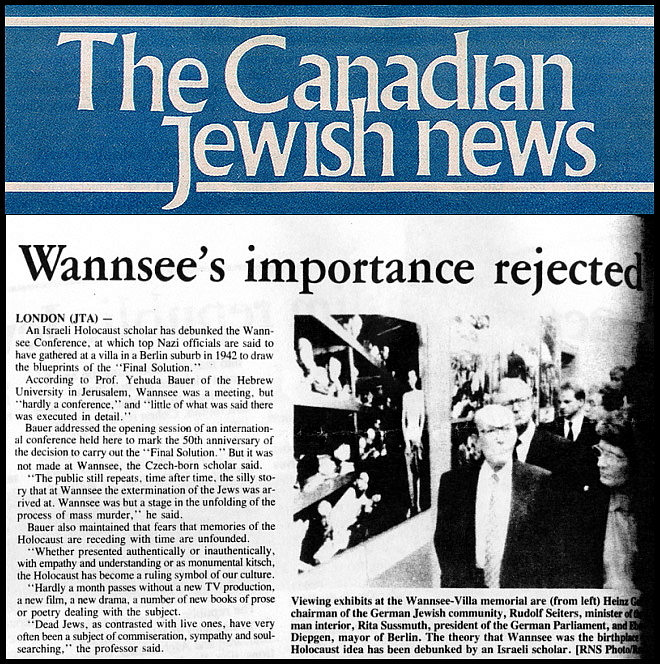 The Nazis had already thought and planned for pan-European solutions to the Jewish question in 1940 - now they were going to implement them, as is clear enough from the Wannsee protocol. So it's a simple matter of backtracking from Wannsee to identify the most probable moment. Since essentially nobody now believes it was the Goering-Heydrich tasking of 31 July 1941 yet this was an important 'warning order' for eventual implementation, the time-frame narrows to the autumn or winter of 1941. Until the 1990s, the relevant Goebbels diary entry wasn't available, so interpretations by Burrin and Browning developed earlier are no longer as robust. There seems to be a semantic confusion at work here, partially caused by translation issues. The primary sources such as the Goebbels diary speak of the destruction of Jewry in Europe, so I am just repeating the contemporary language. Destruction (Vernichtung) would be murder regardless of whether it it caused directly by shooting/gassing or indirectly by privation and exhaustion. But to avoid confusion, I would err on the side of speaking simply of destruction, and looking at the text of the Wannsee protocol to understand what was meant by biological destruction or physical destruction, as well as to figure out what the Nazis had in mind at the turn of 1941/42 to bring about the destruction of Jews. The answer is: a lot more ghettos and forced labour than was eventually the case, since we see projects like DG IV receiving more emphasis. But, nonetheless: destruction. This would absolutely include partial exterminations, mass killings and massacres, since these were ongoing in the USSR, the destination of many deportations was meant to be the Soviet Union, and key players knew about the shootings. German Auftragstaktik as well as Hitlerian tendencies towards delegation easily explain why a Hitler decision to 'destroy' European Jews could remain firm while the methods and proportions and pacings of who was to be destroyed when and in what ways, changed. Denying-History wrote: From memory Irving cites a passage from Martin Bormann‘s diary showing the attendance of a number of associates. And gives the time of the meeting if my German isn’t that crappy. Thanks, I'd not known of a Bormann diary entry. As noted, Gerlach cites other sources for the meeting besides the ones I listed; one is a teletype message from Bormann. Denying-History wrote: Though I didn’t mean to imply it as “the order” what I mean is it became the period in which Hitler decided to centerialize “his” program. Denying-History wrote: Balsamo is still confusing me... he seems confused considering the concept of Gerlach‘s article from what I understand was presenting a thesis that the Holocaust developed greatly - “accelerated” - throughout December, not that December 12th was the date of a decision/order. Yes Borman wrote in his diary (more an agenda actually) that a meeting with the NSDAP elite will be held on the 12th of december from 16h30 to 19h. No one ever contested that the meeting took place. I may have been to harsh with Gerlach article, as usual. Actually, it is really good as a whole. But contrary to what you seems to think, one of his objective, if not his main one, is to identify the DATE when the decision to exterminate the Jews has been taken, and step by step, reducing the potential period, starting with "it must have been between the 7th and the 14th", and then, using Goebbels entry in his diary, determined that it was the 12th, along with who was there (a dozen who indeed were essential to the Final Solution), etc. From there it is pure speculation, i am afraid. Mind my comments on Martin Bormann were more directed at SM rather then the spat between you siding with Evans vs him entertaining (possibly) the ideas of Gerlach. Really in the end no one accused anyone of claiming the meeting never happened. It’s really that in December Hitler probably made the final decision to expand the genocide to centerialized control. Something possibly supported by his underlings considering Chelmno’s construction began two weeks after Himmlers decision for the first deportations to be sent to Lodz. Göring even took action sending his famous July 31st 1941 letter to Heydrich, one which Heydrich produced the first draft of. Mark Roseman suggests this document shows a considered plan by Hitlers ranks to create a deportation program into Siberia that would require Rosenberg’s approval. We all know the failed ideas that were considered past this point such as the managascar plan and the adoption of shootings on the eastern front. Pressure grew from below to remove “useless mouths” which it seems concentration camp Belzec was based on. Globocniks letter of October 1st - which probably materialized his meeting with Himmler on the 13th - was one of the first letters I know of to consider a program of murder. On the 17th Globocnik et al. decided on cleansing the Lublin area talking of « Jews being transferred across the bug river ». Hitler seems to have ether guided or followed along with his underlings on October 25th 1941 recalling his prophecy and stated « Let no one say to me we cannot send them into the swamps! Who takes any interest in our people? Is it good if our advance is preceded by fear that we will exterminate jewry? The attempt to create a Jewish state will end in failure. » a clear reference to the Pripet Marshes as Roseman notes. Though this is far from his only time making such statements if Trevor-Roper‘s translation of table talks can be trusted (which it cannot) and it wouldn’t be in all cases directed against the Jews. What is interesting is the day before Hitlers meeting on December 12th 1941 he made the following statement « Even if we didn’t have a treaty with Japan, we would be quite clear that is the intention of the Jews and their Franklin Roosevelt to destroy one state after another. » Showing he had a clear focus on America’s declaration of war on Japan. What we see is a slow build up from below for a more centeralized extermination program to remove the Jews from overcrowded ghettos, with aspect of Hitlers “prophecy” coming true which all seem to consolidate into December for his decision to finally be voiced for a consolidated effort to exterminate European Jewry. Anyway I’m done with this possibly slightly incoherent rambling. I think however it’s safe to say Evans was unfair in his polemic. And probably wrong about his distancing. Will get around to asking him for a reference if he has one later. Last edit: Alright. Hopefully its more readable now. Last edited by Denying-History on Mon Jul 23, 2018 10:34 pm, edited 5 times in total. >> And probably wrong about his distancing. Just to add, I looked in Google Books to see if Evans had a footnote for this point, as I don't know very few of Gerlach's publications; sadly, Google Books has Evans' book online in that no page number / no footnote format used for some titles, so I couldn't tell. Btw in his 2016 book Gerlach highlights "central control" as an aspect of this, as you do. I cited where you could read the full review but it won't have any citations. What book are you looking at? Although as long as we are not dragged down to Wannsee, it should be fine. I have the article right in front of me. So please be more explicit. I never said he assumed a meeting on the 12th day, as i wrote above, everyone knows it took place. I said, or at least wanted to, that he concluded that it was at THIS DATE that Hitler shared his plan to exterminate the European Jews (in my English translation there is no Jewry). Could you give me the pages where Gerlach speaks about others scenarios in this article? But i can understand that it is easier when one agrees with what one reads. (...) quite identical" to previous declarations: the salient point is that Goebbels wrote, literally on 13 December, of Hitler's resolve that now "Regarding the Jewish question, the Führer is determined to clear the table." Is what i meant by "literally" (which is the expression used in French). Point is he will repeat such things almost every times he will meet Hitler to discuss the fate of the Berlin Jews he wanted so much to get rid off. He will nevertheless have to wait, table cleared or not. This does injustice to Gerlach's arguments about his sources, which you contiNo, it was simply included at the end of what I copied and pasted on Gerlach's discussion of the attendees, something you'd claimed he didn't pay attention to. nue to mischaracterize as simply Goebbels' diary, and to his reasoning. I listed only some of his sources and didn’t go through his full reasoning on why this timing works out. I suggest your re-reading the article to see what sources Gerlach uses and arguments he makes. My point is that he would not have picked the 12th of December without Goebbels entry diary. I have nothing against his sources, just the way he used them to make his case. Agree. At least it should. I was expressing my impression after reading his article. Sorry, but the quote is baseless nevertheless. As the NSDAP was not directly in charge with killing the Jews within the Final Solution. In his article he focus on those Gauleiter who indeed had an implication in what would follow and/or in what preceded the meeting. This does not represent 50 people (and if one has to believe him that such meeting was compulsory for those with a NSDAP mission, there were probably more attendees). Still he does not mention any other contents that could have been spoken about during this 2h30 meeting, focusing exclusively on what concerned the Jewish Question, that is a few lines in Goebbels diary in an entry said to make 7 pages. He justifies the fact that those Gauleiters (the majority of them) who were not directly involved in the Final Solution, were somehow involved because on asked for his Gau to be cleaned of Jews, another did participate in deportations, etc...as if deportation meant clearly for all of them that the majority of the deportees would be killed upòn arrival. This is what i call an unsupported assumption. Thanks for confirming that he picked the date by elimination. Other days are not really supported by sources. He would not have been able to pick the 12th without Goebbels entry, quite simple. FACT is we know that this meeting took 2h30, and he resumed it to a Hitler's typical Antisemitic rant. I mean that it is not a matter to determine whether Hilter meant it or not - we know he meant it - but a matter of whether or not the attendees had any reason to take it at face value that day. They are enough other entry in Goebbels diary after this date to conclude that it was not the case. Actually, re-re-re-reading page 792-793 as you asked me to, by stating the reaction of local authorities, among them Church Leaders, asking for the expulsion of "all individuals wearing the Jewish star" and their deportation " as born enemies of the Reich and the world" clearly shows that whatever the message that Hilter delivered that day (actually exactly what is in Goebbels diary) has been spread fast, which is not surprising given the nature of those "Golden pheasants"...which is precisely why a decision "TO KILL" would not haven been shared with them. Rumors about the real fate of the German Jews will indeed leak and spread among the German population, but not until much later (mid 1943 or so, and even then). That a new impulse was given to the Jewish Question on the 12th of December makes no doubts, but Gerlach, however you read his article, speaks of a shared decision to "exterminate" all the European Jews. The fact that i do not read or understand or draw different conclusion from one article the same as you does not mean that i do not read, understand it inaccurately. There are just no elements to confirms that the NSDAP and its members, while contributing to the expulsion of the Jews from their GAU, knew that they were sending those people in most case to systematic murder (not that they would have cared by the way), they were of course aware that this was something definitive, the Jews were gone and that was enough. What happened to the Jews after they left was not their problem, and there would have been no reason to share the real means used to "solve the problem". Balsamo wrote: Could you give me the pages where Gerlach speaks about others scenarios in this article? Balsamo wrote: Is what i meant by "literally" (which is the expression used in French). Point is he will repeat such things almost every times he will meet Hitler to discuss the fate of the Berlin Jews he wanted so much to get rid off. He will nevertheless have to wait, table cleared or not. You are missing the point: the key thing is that Goebbels said that the Führer was now expressing a determination to be done with the Jews, framing the then-escalating rhetoric and repetition of the formulas with this determination. Frank said pretty much the same thing a few days later: "As for the Jews, well, I can tell you quite frankly that one way or another we have to put an end to them. The Fuhrer once put it this way . . ." and so on. Balsamo wrote: My point is that he would not have picked the 12th of December without Goebbels entry diary. He has other sources for the date, like the telex we discussed. I think that Gerlach takes a variety of sources into account, including of course Goebbels diary entry, to pinpoint the date of the discussion. Balsamo wrote: I was expressing my impression after reading his article. Which expresses conclusions based on sources, not premises. Gerlach did not set out with a date in mind but tried to understand the logic of summer-fall 1941 and then specific sources on the December discussions. That is really clear from his article despite your rhetoric about "premises" and "holy grails." Balsamo wrote: Sorry, but the quote is baseless nevertheless. You asked about a specific line, so I didn't comment beyond that. Balsamo wrote: As the NSDAP was not directly in charge with killing the Jews within the Final Solution. I'd just refer you to Nick Terry's post above, which to my mind dovetails with Gerlach's article. Balsamo wrote: focusing exclusively on what concerned the Jewish Question, that is a few lines in Goebbels diary in an entry said to make 7 pages. Balsamo, no matter how many times you claim this, it is simply not true. I've listed a number of sources which Gerlach surveyed - Nick mentioned others - and Gerlach specifically focuses on Frank's speech, attributing importance to it, writing, "On December 16, at a meeting of the officials of the General Government, Hans Frank delivered an infamous address. In several of its passages he alluded unmistakably to Hitlers announcement of his decision on December 12" - followed by a lengthy quotation from Frank's speech, which elsewhere he connects to a Rosenberg diary entry. Balsamo wrote: Thanks for confirming that he picked the date by elimination. That's not what I wrote: I said that he reviewed some other possible scenarios and explained why he rejected those. That Gerlach went through these shows that he considered alternative hypotheses. Balsamo wrote: FACT is we know that this meeting took 2h30, and he resumed it to a Hitler's typical Antisemitic rant. To maintain this you must ignore the other sources which Gerlach discusses. And the larger context. I feel you've shown a commitment to ignoring these, indeed. Balsamo wrote: The fact that i do not read or understand or draw different conclusion from one article the same as you does not mean that i do not read, understand it inaccurately. As I have several times made clear, I am leaving aside our differences of interpretation and here objecting to your distortions of what Gerlach said, such as that he relied only on Goebbels' diary or that he didn't pay attention to who attended the meeting on the 12th. nickterry wrote: I think you need to re-read Gerlach's article, Balsamo, and to re-read several standard works on the origins of the FS (Browning, Longerich, etc) as well, to really *understand* the thesis and the argument properly. Nick, there is no need for condescension here. But again, you seem to conclude that i reject somehow that the month of December 41 was essential in the development of the Final Solution, or that i dismiss the fact that crucial meetings took place regarding this issue. Which is exactly what i wanted to express. As i wrote just above, yes no doubt that there was a shift following all those meetings of December 41, and locally because of the meeting of the 12th. But let me say that what you put into perspective saying this, that "destruction", translated in English by "extermination" is not to be understood as extermination by immediate killing, is not clearly expressed in my English version of Gerlach article, and i really wonder how many readers would have had the same perspective. And who could be blame when "die Vernichtung des Judentums " is translated to " the annihilation of the Jews ", or "extermination of the Jews", honestly, who among the readers could possibly understand that "extermination of the Jews" should not be understood as immediate killing or at least as a policy involving immediate killings ?? Again, i do not re-reading books i have already read many times to understand that December is a crucial month, and that new impetus were given the Final Solution, that is a mobilization to optimize the deportation - which will reach some of the Western European occupied territories only months later, as a matter of facts - but when an Historian states clearly that the decision to exterminate the Jews was shared with an improbable audience on the 12th of December, without precising that ,of course, "extermination" does not imply systematic murder, my conclusion is: or the author is completely wrong or he is misleading. I guess that everyone interested can now read the article and share if yes or no they have concluded that during this speech Hitler shared a decision about exterminating the Jews without being understood that it would involve mass killing. This precise point has always been my issue: there is no way that the Final Solution could have been so successful if the words had been spread that deportation meant mass murders to every one. That it is impossible to understand the secrecy that surrounded the "Aktion Reinhard" if the operation had been spread among the least reliable members of the Nazi Regime, the so called "old guard", which for most could be described as a bunch of "boasting idiotic corrupted thieves" who would later express the extend of the incompetence by 1945. So it is not just review if i understand it correctly. Balsamo, sorry, not buying the some Gauleiter more worthy than others to attend the meeting notion... regardless of other ranks, proximity to Dolfy, or anything else, the centralization concept necessarily requires that Bormann ensured full attendance at the meeting.